"Iran is on course to develop a nuclear bomb within six months and time has run out for further negotiations, a senior Israeli minister said." Israel feels that "unless it faced a credible threat of U.S. military action, it would not stop its nuclear activities." The so-called new "moderate" Iranian President, Rouhani, told the UN today that they pose "absolutely no threat to the world or the region." To prove this he said that his country was willing to hold time-bound talks on its nuclear program. More talks are just a stalling process for his country to continue progress. It was emphasized that he wanted everyone to recognize Iran's right to enrich uranium and that their nuclear program is a peaceful one. How about that? Only about 6 days ago NBC was told they Iran will never build nuclear weapons. To show their good faith, they have freed 11 political prisoners including Mohsen Amenzadeh, a politician and the prominent human rights lawyer, Nasrin Sotoudeh. Their case is being well orchestrated, evidently. Then he had to get his nasty digs in about Israel by talking about Palestine, saying it is under occupation. He went on claiming that their basic rights were being violated and that they were deprived of the right of return to their homeland. Those of us who know the history of the Arabs that are called Palestinians, something Jews were also called who were living in the land that was to be the Jewish Homeland, as voted by the UN's former organization, the League of Nations, know that there never was a country of Palestine. It was just the name the Romans gave to the land when they conquered Jerusalem in 70 CE. Rouhani knows that Israel was created by not only the League of Nations in the 20's but also by the UN on May 14, 1948. The Palestinians and evidently Iran continues to propagate this myth that there had been a Palestine country and that these Arabs have been tossed out of it. Not so. Most all the ancestors of the present day Palestinians were people who followed Jews in their building from 1880's on. They came from all over the Middle East as they heard about the prospects of getting jobs with them. Now they want to take over the country. Time spent reading Joan Peters book, From Time Immemorial would enlighten Rouhani. Peters went to the actual original records to get her information about the "Palestinians." If the next 9 months of meetings between Israeli and Palestinian represenatives stay on course, there will be no such thing as their right of return. They weren't on the land designated to be a state of Palestine in the first place. Some were here, but much fewer in number, and they left because of the Arab attack of 1948, minutes after Israel was pronounced a new state. They left because their leaders told them that they were taking over this new state of Israel and when the attack was over, they could move back in and even take over the Jews' homes. Weren't they surprised to find that the ones who won were the Jews. So what did these brilliant Arab leaders do? Tell their people to remain in refugee camps set up for them. And there they have been for the last 65 years, pawns of their leaders led to think that they are destroying Israel this way. It's a good thing that the Israeli delegation at the UN walked out just before Rouhani spoke. They would be been revolted at hearing this vision of history. Just like Amadinejad's former speeches, the Iranians take these speaking opportunities to vilify Israel. Only last week Rouhani refused to recognize that the Holocaust actually happened. I wonder what material he calls historic for his research? President Obama has a different tactic. He has reached out to Rouhani at the meeting and let the members know that he is testing the diplomatic path. He seems to believe this could be a step down a different path than taken by Mahmoud Ahmadinejad and that they are interested in reaching their potential in commerce and culture, science and education. He recognized before all that the status quo will only deepen Iran's isolation. The status quo has been since 1995, that the United States has had an embargo on trade with Iran. According to a 2013 BBC World Service Poll, 5% of Americans view Iranian influence positively, with 87% expressing a negative view, the most unfavorable perception of Iran in the world. Behind the scenes Obama has told Netanyhu that he isn't being fooled by these words. He said that actions will speak louder. Yes, they certainly do speak louder than promised words. Back in 2002, President Bush said that Iran was the axis of evil. He saw that the proliferation of long-range missiles developed by Iran constituted terrorism and threatened the United States. Since then, Iran has come into nuclear material and has been working day and night frantically to manufacture what most people see as nuclear weapons. This come from all the threats they have made on the USA and Israel. Since Israel is standing to receive the greats threats being much closer, the USA had promised to stand by them and not allow the production to reach this point. Was that like the Syrians who were not to reach the red line? They've already crossed that one. Now Syria's Assad has much more time to move his chemical arsenal over to Lebanon which has been seen on the radar. Israel has been greatly threatened by Iran. "President, Mahmoud Ahmadinejad, and his demand for "the regime occupying Jerusalem" to "vanish from the page of time", has led Israelis to fear an eventual attack from Iran." The attitude comes from the religious leader, the Ayatollah. A change in the presidency has not altered that, only the manner of the presentation of a new speaker. Now, instead of saying that Israel is a cancer and must be removed, Rouhani is preaching "tolerance." Netanyhu will be at meetings on September 30 and November 1st. No doubt he will address the Iranian developments. Curry asked the Iranian president whether he believed the Holocaust was a historical fact, to which replied by saying he was a politician, not a historian. His refusal to address the subject in that interview was one of the reasons cited by members of the Iranian Jewish community in the United States when they refused an invitation to meet Rouhani in New York. Iran’s new president admitted on Tuesday that the Holocaust took place, in a sharp contrast to his predecessor. 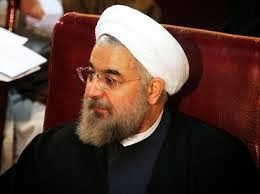 Speaking to CNN’s Christiane Amanpour, Iranian President Hassan Rouhani said that the Nazis committed a "reprehensible" crime against the Jewish people. The remark came in response to Amanpour’s question if he accepted that the Holocaust occurred. "Fars however, categorically denied the claim that Rouhani addressed the Holocaust by name, saying the network “fabricated” the story, adding the word ‘Holocaust,’ among other conciliatory phrases, to its translation. What Happened to the Jews of Aleppo, Syria ? Who Are the Syrian Rebels That Obama Is Arming?